Home › Uncategorized › Perfect Pen or Holy Grail? Perfect Pen or Holy Grail? It all depends on the paper – how the pen works, that is. This realization comes from many years and many journeys in search of the “perfect pen.” For me, this odyssey is the search for my personal Holy Grail – that ever elusive thing that promises health, wealth and happiness (and eternal salvation)! In truth – I have no illusions about health and wealth unless a gliding pen serves as a secondary sort of salve. Makes sense, right? Health as a side effect from the glee of finding and using that pen; wealth from the bestselling novel that follows! In truth, my lust is about simpler stuff. I search for that perfectly balanced, correctly weighted, optimal tip and a “smooth-as-butter” ink flow that writes “first time every time!” In addition, this, the ultimate recorder of text, must magically transform my unreadable, ugly script into something beautiful and swan-like. All of this for less than $50. Does such an instrument exist? No. Well …. Sort of, and here’s why my equivocation. After many sweaty treks through the hottest days of summer and slippery slogs on the snowiest days of winter, I finally arrived at the answer. And this is it: it’s not just the pen. It’s the symbiotic relationship between pen and paper that makes the magic. 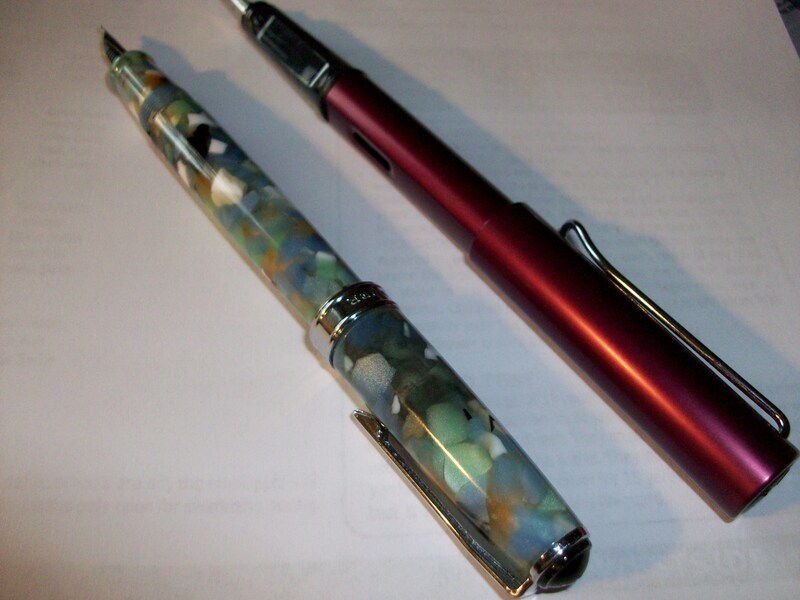 For example – I recently purchased two really wonderful pens – one a Levenger, the other a Lamy – both fountain pens. I then bought a notebook at Staples to use as my journal. I then sat down for a long writing session with my new pens and my new notebook only to be thwarted with tremendous disappointment. First one, and then the other, fountain pen bled right through the paper – seeping through to the other side as well as yielding veritable ink blots that cut a far bigger swath of spreading ink than I intended. Back to the original question: is there such an instrument? I have my top 10 favs, but the pen du jour is a shifting sand that balances precariously on paper, type of pen, my coffee consumption, and purpose in writing. In other words, I think I might have better luck seeking the Holy Grail!